My thoughts are with every one in New England, and I hope y'all stay inside and safe from Hurricane Sandy. I rode my bike to the gym last night and thought I was going to get knocked over in the 25 mph wind that was going on! Not to mention it was freezing and drizzling a little bit. I might have to switch from my bike to my car whenever I go to the gym now. Speaking of bikes, the back rack underneath my apartment building is full of people's bikes who don't even use them! It REALLY grinds my gears (see what I did there). There's even one bike that is taking up SO MUCH of the rack and it has MOLD on it, because it's not been moved in a year. MOLD. I want to get sharp cutters and cut the lock and just throw it out into the bushes! Not really, I wouldn't do that (because I don't have cutters). It makes me mad, because it makes it super difficult to lock my bike up and get it in and out of the rack. HMPH! My little tantrum is over. I wore my $1 His House Thrift find. It's a big, comfy, warm sweater and I feel like heaven in it. I used to avoid big bulky sweaters like the plague, because I thought I looked terrible in them, but I'm glad I got over that hump. I also got over the "Oh my gosh I'm pale as snow and can't pull off the color oatmeal!" and made it work with some lovely Clinique lipstick. The sticker telling me what color it is has worn off so if I had to give it a name I'd call it "Deep Rose." If you feel something is going to wash you out, add a touch of blush and lipstick! A lot of my pictures came out blurry today, and I didn't have enough time to take 40 more pictures so I'm sorry for that. I need another tripod so badly (my other one broke) and a remote. I hope you can see the outfit well enough though. 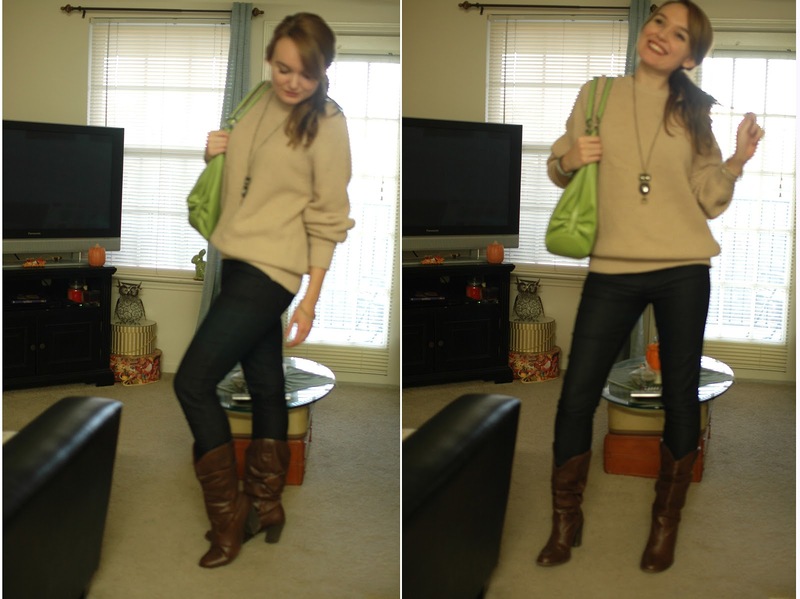 I really liked the pop of the green purse against the other neutral colors. 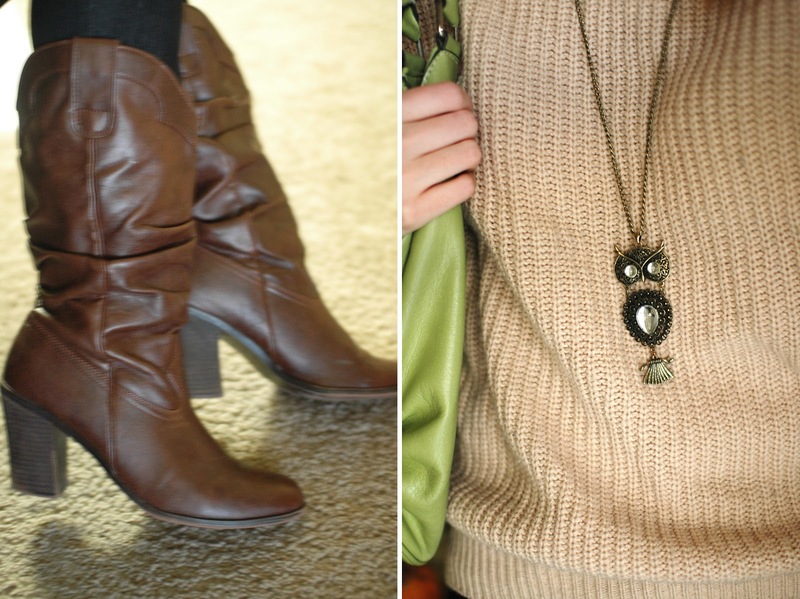 I also absolutely adore my owl necklace and think it really complemented the sweater and boots. My face is LOVING the Olay Regenerist cream I've been using (I'll have to tell you about that another post =]); I just love how it feels and looks lately. Here's a silly picture to end the post. In all this outfit cost me $11.50, because it's comprised of gifts and thrift items. This has been my cheapest outfit yet on the blog! This is why I never accept the excuse, "I'd be more fashionable if I had money." Pish posh! Anyways, I hope everyone had a wonderful Monday, and is ready for the midnight release of ASSASSIN'S CREED 3!!!!! how come you still looks amazing and adorable in your silly photos! My outfit outtakes are seriously not for public viewing, I swear 99% of the time I do actually look like a mean zombie!! LOVE THOSE BOOTS! :-) Glad you're okay. We had some wicked winds here, too. I think that sweater is adorable on you. Oh why thank you =]. I'm glad you're okay as well! The sweater; however, let in a lot of the wind! I have got to remember to wear things that don't have little holes in them on days like that!